A long time ago when life looked very different, I toured a huge ginger plant in Queensland. Don't remember the name or exactly where it was but this is probably the one. 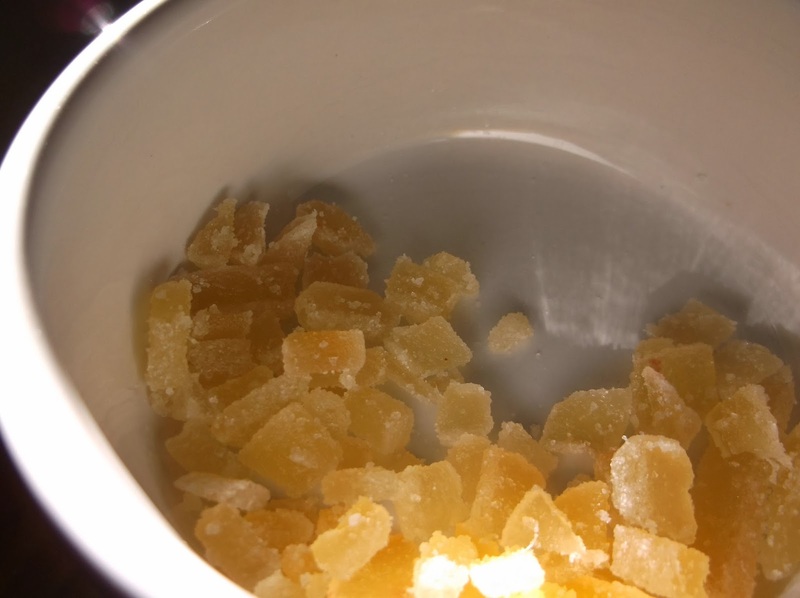 They processed raw ginger, producing ginger in all its ready, commercial forms: raw in a jar, cooked into syrup, dried and crystallized with sugar. Then we got samples of ginger candy. A great idea. 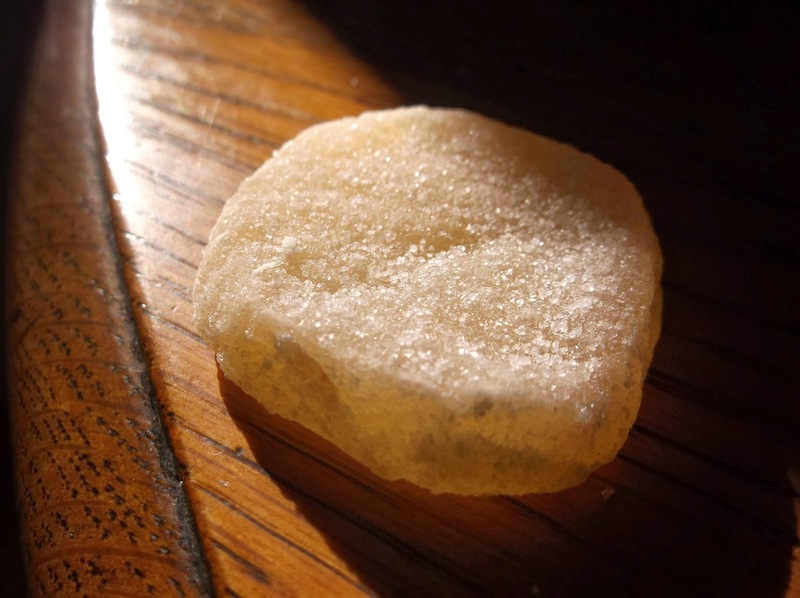 Ginger may not look like much but that taste…pungent, lingering sweetness, then spice. Lots of heat. Wow! But this is not about ginger, or even Australia. Today makes 5 years since the accident. Still here! More good days than bad now, overall. And you know what that means…Last week I took a little vacation from the basics. Had a glass or two of wine with dinner, um, several days in a row! Even a small daily dose of wine is not in the cards. For me it just wallops on memory, balance, and mood. One of those nights had a beer as well, an Eel River IPA. Beer has less alcohol, but I was further reminded that almost all beer contains gluten. It's good to remember stuff! Let's hope I remember better and faster next time. 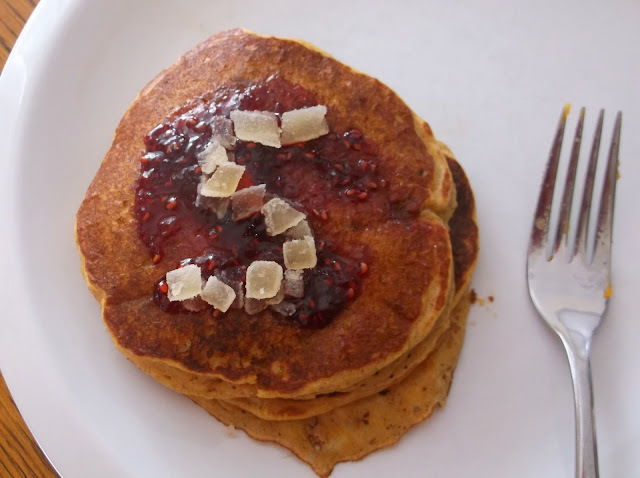 Pumpkin pancakes (GF) with raspberry jam and crystallized ginger - yum! Am coming around to accept a few bumps and imperfections. Not quite there yet, but getting there. It seems to beat the hell out of pretending to be what others want. That takes a lot of time and energy, and it's good to be mindful of how we spend those things. Feel like celebrating with me? It's easy. Find or make something yummy. It could be pumpkin pancakes or something else. It cannot look perfect, that's the only rule. If you have some ginger handy and it goes well with ginger, even better. Eat, experience, plunge right in! Leave a comment to share whatever it was. Or, just enjoy!